Although we can’t say they’re organic (because they’re not), we’re excited to tell you that our peaches are reeaaally close this year! In spite of all of the rain we’ve had here in Tennessee, Georgia has been dry, dry, dry, and that droughty weather means the peach orchard only got sprayed once throughout the whole month of May. Just for comparison, almost all of the peach orchards we’ve spoken with that are anywhere east of the Rocky Mountains spray their crop on a schedule: once every week or 10 days. But we totally don’t get into all of those chemicals on our fruit. And we don’t think you do either. That’s why we seek out growers who care about what they’re putting on the food they’re feeding their own families – as well as yours and mine – and always offer minimally sprayed (IPM) fruit, or an organic alternative. The arid weather spawns another equally awesome quality in peaches – an over-the-top taste! With little rain to dilute all that peachy goodness, peaches turn out on the smaller side, but honey-sweet and sated with flavor. They’ll be juicy too, just not watered down. These are going to be incredible, Friend! 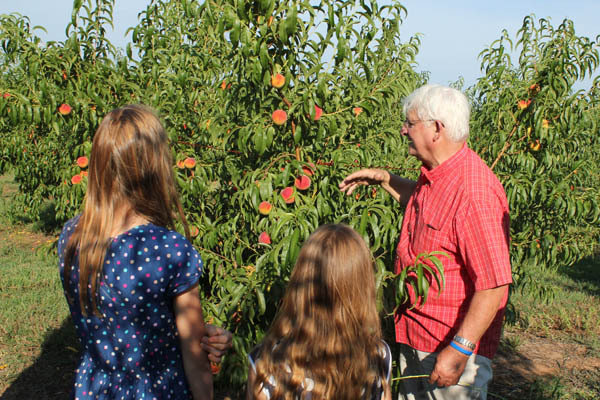 Order your peaches now, expect them to be unbelievably tasty, and know that you’re feeding your family some of the cleanest fruit you can get without paying organic prices.